In 2000, British citizens Ivan Corea and Charika Korea, whose son Charin had been diagnosed with autism spectrum disorder, founded the Autism Awareness Campaign UK to raise public awareness on autism and Asperger syndrome and to campaign for independent research on the causes of autism. The year 2002 was proclaimed Autism Awareness Year in the United Kingdom. On February 9, 2002, Ivan and Charica Corea launched Autism Sunday. They first service for autism was held at St Paul's Cathedral in London. It was attended by statesmen, celebrities, writers, and media. 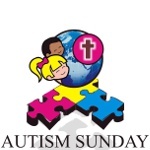 Since then, Autism Sunday has turned into an international event supported by world church leaders, such as Pope Benedict XVI, and influential politicians. On this day, churches of all denominations across the world honor children and adults with autism. The organizers urge participants to speak up for people with autism spectrum disorder and raise awareness of important issues, such as lack of access to public services in health, education, respite care and specialist speech therapy in many countries.